Two thumbs waaay up for Dark Heresy. I have some extra books. Cost is $50 plus $10 ship. Some have slight imperfections (like a scrunched corner– from shipping). I give $5 off for those. We’ll be playing at 3pm to 6pm tomorrow so I’ll be completely, completely incommunicado. However, I’ll be doing my regular thing from 10am to 2pm. So, if you need anything please feel free to give me a call. 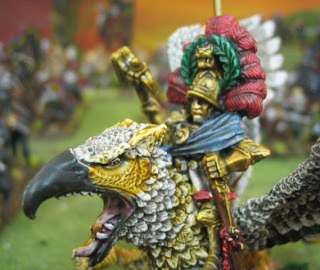 Picture: Empire Captain on a Griffon. This army was done with Artistic License with a L3/5 split (L3 for everything except L5 for heroes). The Painter chose to do the models in Nuln color scheme. Today I was up again at 5am. Wide awake and worried. I got an email from a client asking if I ever went to sleep. Usually quite well, just some extra stress recently. I stayed home this morning with Griffin while my wife ran errands. Then I headed up to Provo for some business plus translating at the MTC. I’m actually getting better. It is very hard to listen and speak at the same time, and keep up with a very fast talker. Then back to the studio for a few hours this evening. Nothing to report. Other than documenting the huge-normous Empire Nuln army. 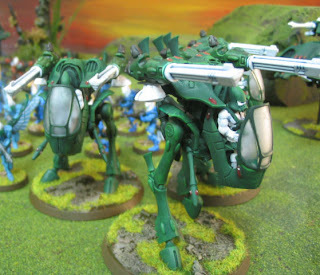 Picture: a squadron of Eldar War Walkers, part of this Biel Tan army. This is our wargamer standard L3 work (L5 for hero types). I was wide awake and worried at 5am this morning. So, I just got cracking on the ole Inbox which I was caught up on as of 8am. Then it was off to a conference at the school for my daughter. That turned out well. The following projects are under the brush and should be done in the next 5-10 days. If you are wondering what’s up with your project, just drop me a line and I’ll get right on it. All right folks, the tide has lowered. Not busy. Also, there’ll be a Batrep up tomorrow morning. I just looked up at the sky and felt a moment of peace. 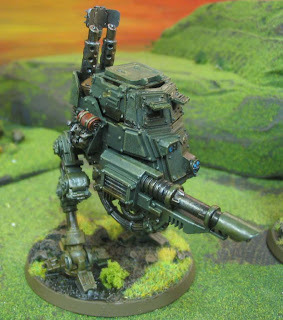 Hey all, I came across this on http://www.warseer.com/ Supposedly it’s a new Defiler type called the Soulgrinder supposedly due out with the new Chaos Codices coming up this year. 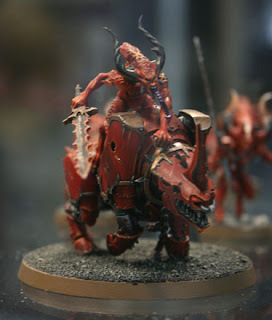 Flesh Hounds, pic also lifted from Warseer. In fact, there are a TON of pics on this thread. This blew my mind. 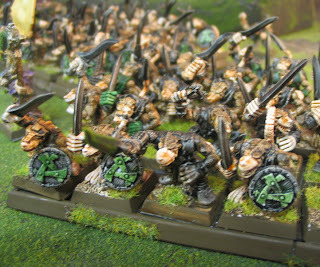 Hey Shawn – just a quick note – thanks for all of the work on my Skaven army. The miniatures were extremely well-packed and you have been great about communicating – It seems like you treated my figures as well as you would have treated your own and I really appreciate that. To be honest, when I first unpacked my miniatures, I wasn’t that excited by them, but I took them to the hobby store this week to play a game and I have to say, once they were all ranked up and together, they really do look very good (props to Patrick) – I received many comments from others who were equally impressed as well (I provided suitable plugs for your studio and reminded myself and everyone that as good as my guys look, this only represented your level 2 work). Bottom-line – this is just what I wanted – turning a huge collection of unpainted and primered models into a nice looking army I can go play with. Overall, I’m very satisfied with the experience, and I’m looking forward to having you do my next army as well (dark Elves in August), or even a smaller project sooner, if one comes to mind. It’s Monday and I’m hammered. So please be patient while I play catchup. That said, by all means ping me if you have a pressing matter. I don’t want anyone to feel like I’m being inattentive. I’ve got my Bluetooth in if you have a short matter. people who need their package to get out (my wife is coming in tonight to pack up all the packages, they will be sent out tomorrow). 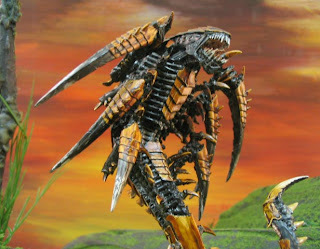 Picture: a Trygon for the Roach Nids– a personal army. First off: I’m a little behind on my emails. I’m really sorry about that. I will catch up on Monday. Call me Monday morning if you have a pressing matter I will be happy to take care of you! The battle report is done. But not posted, possibly until late Monday. Sorry, but you’ll have to wait! The good news is that we had someone skilled in the digital arts take the footage and work on it. Today was quite eventful. It began at around 8am with the alarm going off in the kids’ room, but they are sleeping in another room so I have to get up and shut it off. I splurged on some breakfast at the local Magleby’s and then swung by the Post Office to send out about six projects. Today was Paint Fest. We had a good turnout, about eight people all told, including a few “friends of the studio”. A good time was had by all and we were down here for nearly eleven hours. We also shot a 1000 point battle report with my Guard army against a mini Nid-zilla. My opponent had the new Imperial Armor Apocalypse book which is amazing and only costs like $45. It is right now about 10:30pm and I really need to get home. One last note: if you think this might be the life for you, please drop me a line. You can actually move out here and make a living out of it. I’ve had a number of people do so successfully. There are challenges, but with drive and a lot of hard work, you can take off. I don’t plan on building Blue Table to much past around ten people, and I would just as soon keep the same solid crew and keep getting better and better over the course of ten/twenty/more years. Grow with the company and all that.